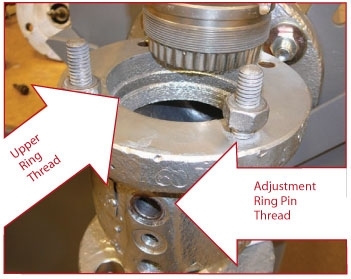 Where extensive damage to a pressure relief valve has occurred, the use of welding as a repair technique needs to be evaluated from both the technical and economic perspectives. The first consideration concerns feasibility of making the weld. Can the materials be identified, and are they suitable for welding? The material specification for a valve body or internal part can usually be determined from the valve manufacturer’s data based upon type or model number. For cast materials, part should bear identification markings as required by material specification. One of the most common materials for valve bodies is cast carbon steel to ASME specification SA-216, grades WCB or WCC. Once material for the part is identified, a suitable welding procedure can be selected. Some materials are not suitable for welding. NBIC Part 3, Repairs and Alterations, paragraph S7.12 b, prohibits welding of ferrous materials with carbon content greater than 0.35%; therefore, valve bodies made of cast iron cannot be welded. Many other materials, such as brass or bronzes, are also prohibited by their material specifications from being welded. If welding is in the VR stamp holder’s program, the next issue is availability of an appropriate qualified welding procedure. To assist in this area, NBIC Part 3, paragraph S7.12.2, provides for use of American Welding Society (AWS) standard welding procedures accepted by the NBIC. A list of these procedures is included in NBIC Part 3, paragraph 2.3. As long as AWS procedure is used without deviation, it is considered “pre-qualified,” and a qualification by the VR Certificate Holder is not required. VR Holders must have a copy of procedures in their records, and each welder using the procedure must be qualified for performance. The need for post-weld heat treatment should also be evaluated. This is usually needed for higher alloy steels or heavy wall castings. Original code of construction should be consulted for guidance in this area. After determining correct qualified welding procedure (based on material and thickness to be welded) and obtaining a qualified welder for said procedure and material, an economic judgment must be made. When time and repair costs related to welding are factored together, it is often more economical to replace the part with a new one meeting original manufacturer specifications. This is particularly true for internal parts such as the valve nozzle or disk where machining would be needed after welding is completed. Direct costs associated with welding and machining are often insignificant when compared to costs incurred due to the protected system being down. Replacement of part is almost always quicker and therefore more economical when costs associated with the down time are considered along with expense of the welding and subsequent machine operations for internal parts. Additionally, most internal parts are manufactured to very tight tolerances. Although material may be suitable for welding, heat input into the part may result in warping or loss of dimensional integrity. Weld repairs are usually considered when the valve body has a defect that needs to be addressed. Valve bodies are not readily available as spare parts, and the time to procure a valve body may be prohibitively long. The most common welded repairs are those to valve bodies. Excessive wear on internal threads is one typical problem found on valve bodies needing welded repair. The valve body incorporates machined threads where adjusting ring pins are installed, where the upper ring screws into the valve body, or where the body to bonnet bolting is installed. In service, corrosion forms in these threads, and a small amount of material is lost whenever the threaded part is removed. After a number of repairs, tightness of parts cannot be assured. The repair process is to perform weld buildup on the threaded area followed by machining back to the original thread specification. Another common problem is damage to flange faces caused by corrosion, leakage across the flange, or lack of care when flange bolts are removed. Sometimes when bolting is corroded, a torch is used to cut the bolts in half, often resulting in flame cuts on the flange face. Gaskets then cannot seal on the damaged surface when valve is reinstalled. If a flame cut or corrosion is not too deep, defects are sometimes removed by machining the flange face. Care must be taken to ensure remaining flange thickness still meets applicable flange standard, as stated in ASME B-16.5. When cuts are too deep, the gouge can be ground to sound metal and a weld build-up performed, followed by machining back to desired thickness and surface finish. Final inspection is done by consulting the flange dimensional standard. Loss of material due to corrosion or erosion is another potential problem. General corrosion over a large portion of the valve body would likely be a good reason to consider replacement (complete valve replacement is often a better choice). Localized loss of material, often at bottom of the body where moisture can collect, may be a candidate for weld build-up, followed by grinding back to original contour. A valve subjected to excessive external loading, perhaps due to insufficient pipe supports or clearance problems may result in cracking of valve body. Repair of a cracked component first requires removal of defect by grinding or other suitable method. Suitable non-destructive examination may be needed to verify crack is completely removed (Ref: NBIC Part 3, paragraph S7.12 c). Dye penetrant (PT) testing is a common method of “chasing the crack.” Once the crack has been completely removed, the cavity formed is filled with weld metal and the final surface is re-established by grinding or machining. A weld on the valve body not included in scope of repairs done by a VR Holder is the attachment weld for a valve being permanently attached to a boiler. This weld is done during initial construction of the boiler by an ASME S or PP stamp holder. When valve is removed and reattached to a boiler for repair, the weld must be done by a National Board R stamp holder. Many considerations must be evaluated to ensure weld repairs made to pressure relief valves are done correctly. The final product must be capable of performing its intended function. 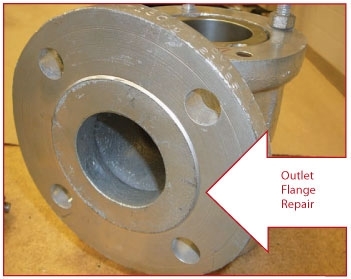 While a weld repair may be helpful in returning a damaged valve to service, care must be taken to ensure the valve will meet applicable ASME and NBIC requirements. VR program requirements that must be addressed by VR stamp holder are outlined in NBIC Part 3, Repairs and Alterations, paragraph S7.12. Repair organizations not familiar with these requirements should consider other repair options or seek competent technical assistance.